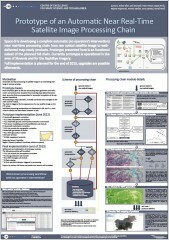 Fully automatic processing of satellite data is a dream for every remote sensing professional. Within the Slovenian Centre of Excellence for Space Sciences and Technologies (SPACE-SI) we have done first steps towards fulfilling this dream. We have developed and implemented a complete fully automatic processing chain (called STORM) that includes all necessary processing steps from sensor-corrected (Level 1) optical satellite image up to web-delivered map-ready products. The three major processing steps of our STORM processing chain are same as for every common processing workflow of optical satellite data (these are: geometric pre-processing, radiometric pre-processing and finally different automatic interpretations), however with one crucial difference: all steps are performed near real-time and fully automatic (i.e. no operator’s intervention). Workflow of the STORM processing chain, developed by SPACE-SI. On the right supported sensors are shown (status May 2015). 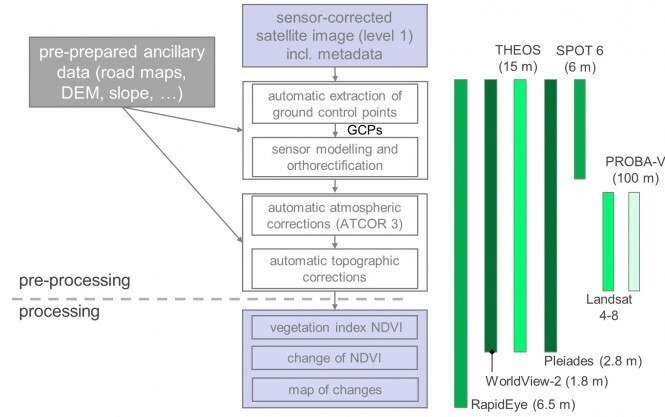 automatic generation of user-oriented products (Change Detection; vegetation index NDVI; Change of NDVI). Modules are prepared in IDL and C++. The main control module and web viewer however are prepared in Java. The chain is triggered by the appearance of new satellite image on the dedicated FTP server. Immediately after processing all chain products are available to the end user via the web mapping application (note: from a single input image 5 final product are generated). The STORM processing chain is tailored to the extended area of Slovenia and to our national coordinate system D48 Gauss-Krüger, support to other regions/countries and coordinate systems is in plan.